Merlot has found a new home in the soft rolling hills of the central Tuscany. Our clay soils bring out the round, smooth body typical of the very best Merlot. 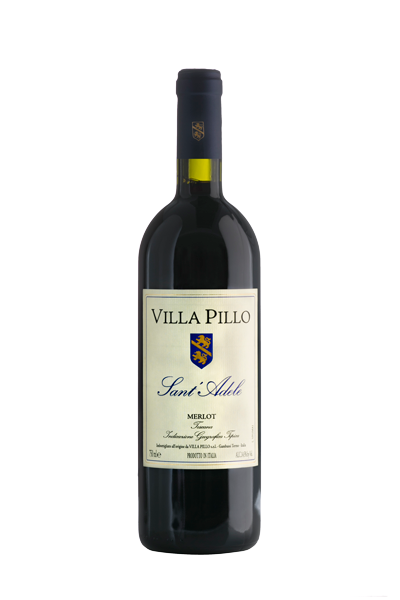 Merlot at Villa Pillo is grown in three principle vineyard sites. 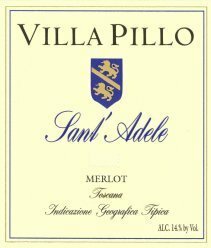 Sant’ Adele, Meliana and San Michele with a selection of the best wine being bottled under the Sant’ Adele label. Vertical trellising with foliage catchwires supporting the annual vine growth ensures the maximum exposure of the grapes to both sun and air movement. These elements help the development of both healthy and flavourful grapes. Manual operations of removing surplus shoots and leaves and careful selection at the moment of harvest further enhance quality. Tuscany’s hot summers in August ensure that Merlot is our first variety to be harvested in early September. Picked at the peak of ripeness to accentuate its fruitiness, this wine was then aged in small oak barrels to enhance its balance. Merlot’s flavours of ripe dark fruits such as plum, blueberry and cherry are further broadened by ageing in small barrels for 12-15 months in the Pillo Cellar. We recommend this wine with all roasts or grilled foods and any flavorful pasta like one with tomatoes or eggplant. Vineyards: Planted from 1991 to 1995. Harvest: 2nd, 4th and 8th September. Age in oak: 15 months in Taransaud french oak, 80% new barrels and 20% one year used.